A beautiful slot game based upon the theme of a mystical forest where a troll resides. Although there’s not even a close connection between the trolls and the electricity, but that’s what makes Electric Sam unique. Elk studios came up with an amazing concept of a casino in the heart of a forest run by a Troll. The game has a total of 5 reels and maximum 243 winning combinations for the players to hit on. It has numerous bonus features including the wilds, multipliers and attractive symbols. The complete graphics of the game are bright and beautiful. Behind the reels can be seen a background of forest area which is brightened up by the fairy lights put up by electric Sam. Sam’s wife, Sandra and their daughter Maggie welcome the players to the game with warm regards. 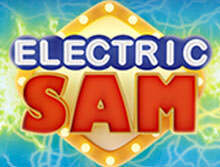 A safe and reliable place to play Electric Sam powered by Elk Studios is bCasino. The online casino offers games from all the leading game developers like NetEnt, Play N Go etc. It has a number of popular casino games for which people come back again and again, and Electric Sam is one those games. The graphics provided by the casino are amazing and the platform’s integrity with user-interface is recommendable. The symbols of Electric Sam are very eye catchy and tempting. It has some exotic fruits like lemons, melons, plums, and cherries. The fruits seem like they are drawn from bright neon colors. Other than these, there’s a red colored numerical 7s. Amongst the symbols are the faces of Sandra and Maggie (wife and daughter of Electric Sam) too. There is a bell symbol which acts as the main element to trigger the free spins bonus so keep an eye on that. These bells give you more and more free spins depending on the number of times the symbol appears in a single spin. Other than this, amongst the special symbols is the “Electric Sam” symbol which plays the wild feature by substituting the rest of the symbols in order to form a winning combination. The symbols are all very easy to understand and attractive to look at. They are bright and relatable and do pure justice to the theme of the forest and the name related to electricity. All the symbols hold different value and thus help you score high amounts. Along with the bonuses, there are a number of strategies which can be used for betting so that the bonuses are triggered better and payouts are more. With the tracking of the history of wins or loses the game can even turn to the automatic mode of raising the wager levels. There are three different options available for you to choose your preferred one from. Free Spins: With the appearance of three or more than three scatter symbols which are in form of bright bells will trigger the option of free spins where you can earn a lot of bonuses. If three scatter symbols arise, you get a total of five free spins. In the case of four bells, a total of 10 spins are won, and likewise, on getting five scatter symbols on the screen, 15 free spins bonus round gets triggered. Not just this, in case another bell symbol appears on the reels during the bonus round; a free spin is added in your total spins. Sticky Wild: If three symbols representing the Electric Sam land upon your reels, Sam connects his plugs to light up the fairy lights. This will also turn somewhere between 2-5 symbols into the wild symbol and they will stick down on your reels for the rest of the game. Multipliers: if Sam’s wife Sandra’s face appears three or more times on the reels, the multiplier gets activated. In this, the bet amount gets multiplied from a range of 1x to 10x. Imploding Symbols: Landing Sam’s Daughter, Maggie’s three symbols on the reels of your gaming screen would trigger the imploding feature. This feature implodes the existing fruit symbols on the reels and transforms them into other symbols with the purpose of making new and better winning combinations. The Elk Studio’s Electric Sam is a decent choice of a slot game. It offers excellent graphics under a jungle theme and a family of troll involving his daughter and wife. The music and sound effects of the game are very amusing and entertaining which helps in keeping the player involved. Apart from this, Electric Sam Slot gives the player an opportunity to win huge bonus amounts by easily triggering the bonuses with simple features. The game is overall simple and easily understandable. When talking about the preference of playing, a slot gamer should definitely have a taste of this entertaining game for sure.